All of us that love cooking know just how important spices are in giving our food that all-important flavor. Spices have been used in foods longer than we have been writing things down. They are used for everything from their taste, color to their medicinal value. 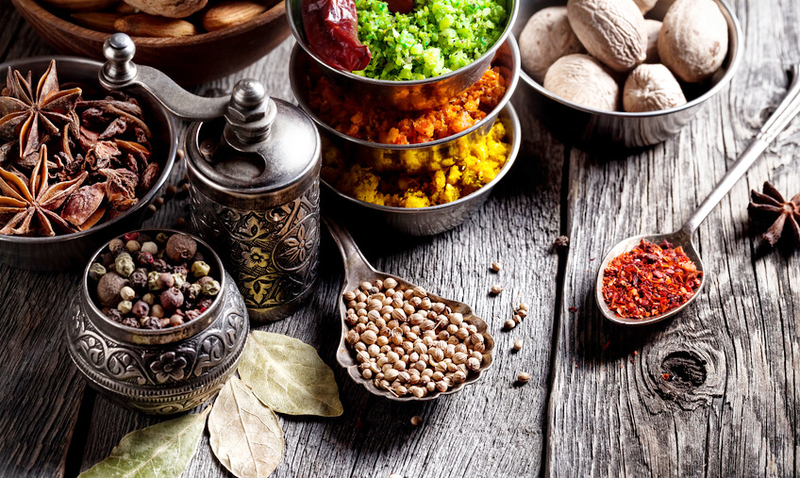 Though in the past we used a small variety of spices, the real explosion of spices into mainstream western cooking really only occurred around 400 years ago with the opening up of sea routes to India and other parts of Asia. Since then spices have become an ever increasing part of our diets and form the backbone to many of our most important dishes. With so many exotic spices at your fingertips, the art of cooking with them has tantalized more and more of us over the last few decades. Though we have come to understand exactly how to cook with amazing gifts of flavor, few people actually realize that they could be getting so much more flavor from them if they used a grinder that has been specifically for use with spices. 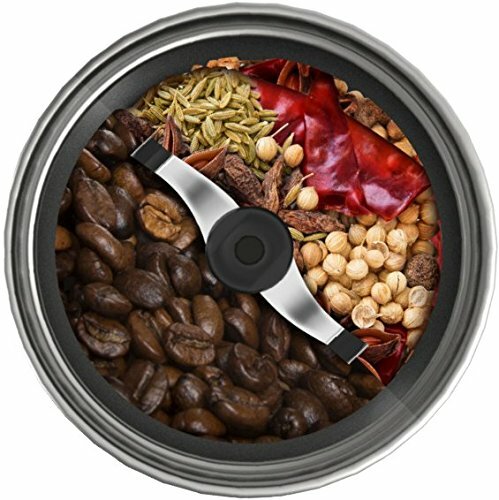 What makes a good spice grinder? There are tens of thousands of different spices that each day chefs around the world add to food. A spice can be a seed, fruit, leaf root or bark of a plant that has been chosen because of its colors, flavor or health benefits. Spices are also used as medicines both in the western world and in the east where they are also used in religious rituals. In the countries where many of the most common spices originate, they take them very seriously indeed. In India and Iran, for example, you can find dedicated spice shops that are crammed with more varieties of spices than you could possibly imagine existed. 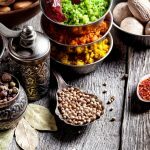 As you might expect, in all of these countries they know how important the preparation of spices is, and that’s before they go anywhere near the cooking pot. Sadly, this importance is overlooked in the west where we unknowingly accept poor quality pre-ground spices and low-grade grinders. Beginning with pre-ground spices, it doesn’t take a lot of explanation as to why these offer inferior levels of taste and quality, it is after all simple chemistry. When you grind something into smaller pieces, the area in which a reaction can take place is massively increased. It is this effect which makes ground spices taste much better than whole ones. The problem is that as soon as you grind a spice into small pieces, the rate at which it breaks down and loses its taste increases dramatically. This means that pre-ground spices have already lost a good amount of their taste before you even get them home. Poor quality grinders don’t grind the spices into nearly as small pieces as good quality ones. This obviously means less flavor but also can result in large pieces ending up in your food that create ‘flavor pockets’ within your dish. A good quality grinder will ensure that whatever spices you are cooking with are ground to just the right size, meaning that they are as fresh and tasty as possible. Though any expert will tell you that by far the best way to grind is by using a pestle and mortar, the problem with this process is that it is very time-consuming. 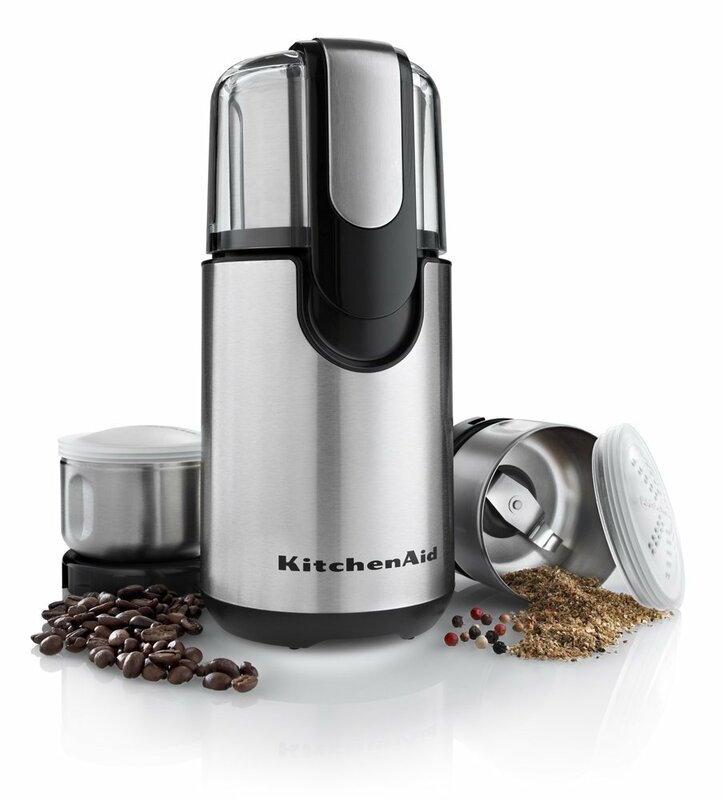 To speed things up for all of us time-strapped home chefs, there are two main types of grinder available: the electric grinder and the hand turn design. These grinders are usually quite small and get the job done with minimal fuss. Most of us will be familiar with a salt and pepper table grinder so will already be familiar with using one of these. There are a variety of different design approaches with this type that involve anything from twist top, turn handle and even pump action, but all achieve the same purpose. 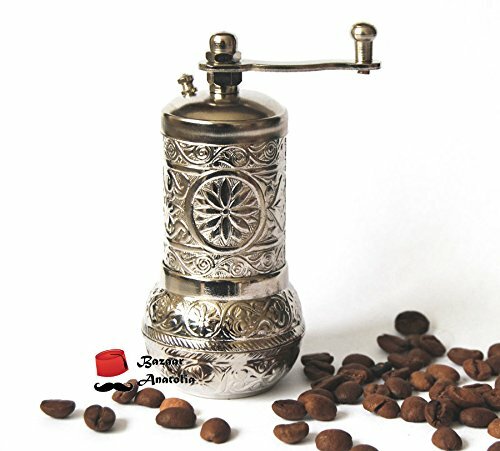 Hand grinders vary considerably as does the grind quality of the spices they produce. The best designs do a really good job, though these designs are definitely limited in terms of quantity that they will product before your arm gets so tired that it feels like it is going to fall off. When you need a serious amount or grinding to be done, it is time to get yourself an electric model grinder. If you regularly cook for large numbers of people or cook dishes that require a lot of ground spices then an electric design is definitely for you. The origins of the electric type start with the first electric coffee grinders. Since coffee shops require the best possible tasting coffee but require lots of it, electric coffee grinders were created to take the workload off the staff. They also free the shops from having to buy non-fresh pre-ground coffee. 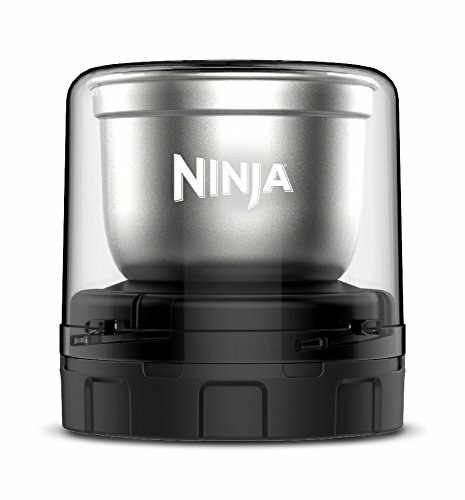 The designers of these coffee makers quickly realized that their product could be used to grind spices and other foods too. This evolution explains why most of the electric spice grinders on the market today are hybrid coffee/spice grinders. Power – It is important to get a grinder with a good power and RPM level. This will ensure that the grinding blades will be able to efficiently chop up all the pieces into the same size. When blade RPM drops too low, larger pieces of spice will find their way through and ruin the consistency of your spice mix. Removable bowls – Not only do removable bowls allow for you to easily remove the ground spices, but they also make for easier cleaning. 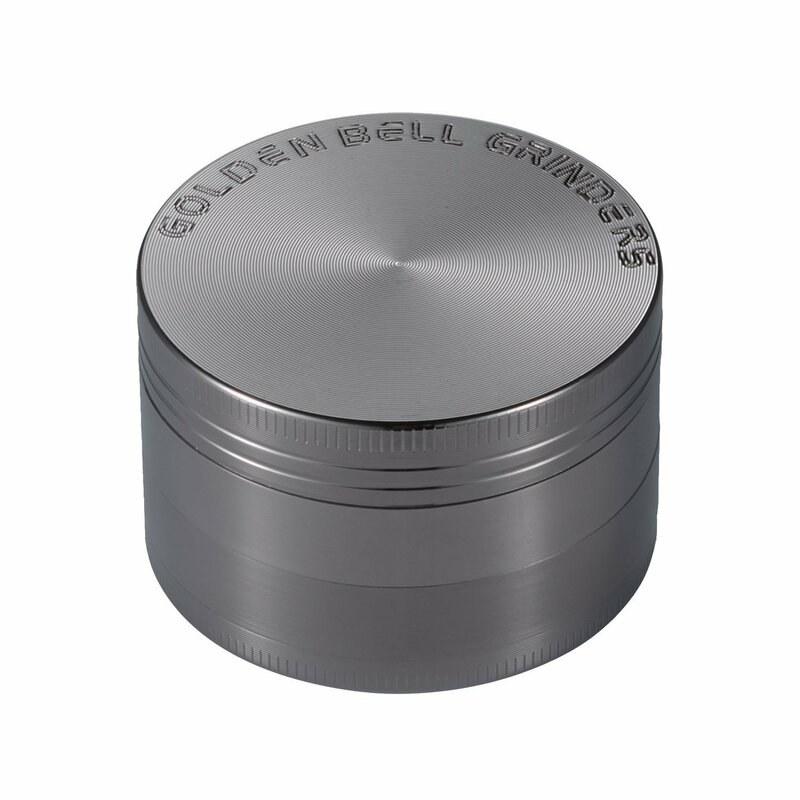 Ease of use – So far as grinders go, the golden rule is always the simpler the better. Complicated designs are generally much harder to clean and have more parts that can go wrong or break. Reliability – As with all electronics, reliably is always important. This is where reputable brand names have the edge as they will generally produce the best quality products in order to protect their reputation. 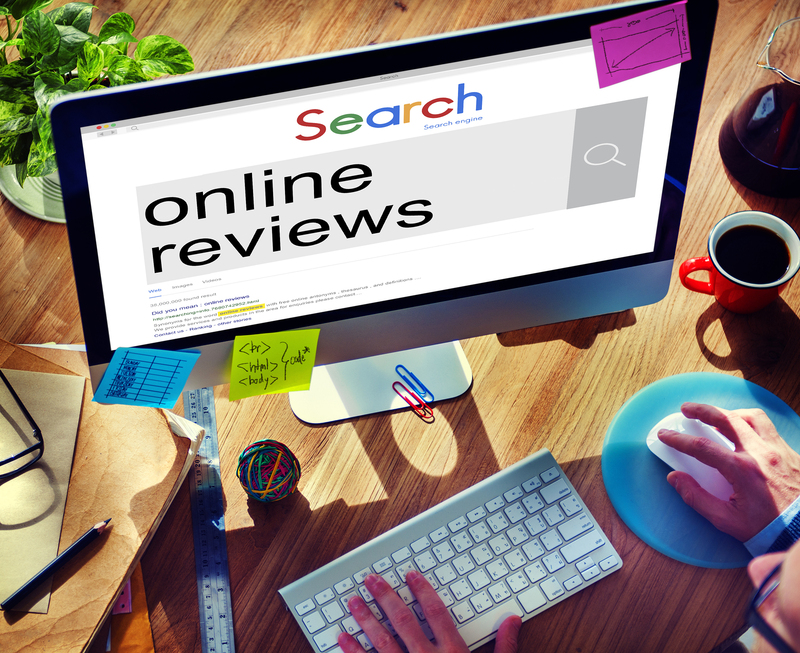 You can, however, find out the reliability of any given product by reading plenty of customer-driven feedback to see what people who are using the item are saying about it. The competition was tough but in the end, this electric model grinder performed so well that we simply had to give it the top spot. This design is for all those serious grinders out there who want the best from their food. 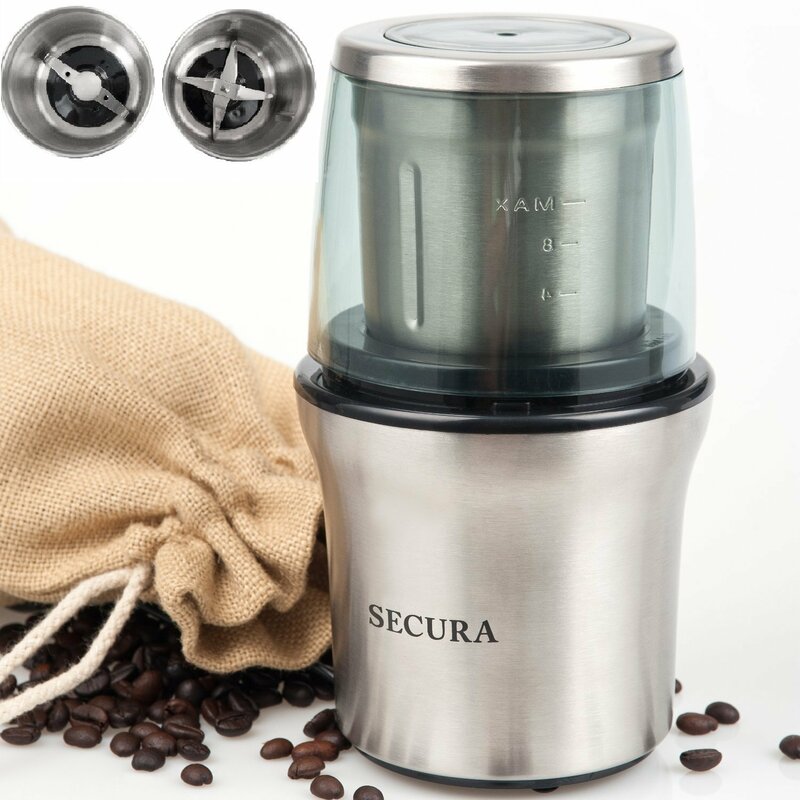 Though primarily designed as a coffee grinder, it comes with a spice grinder accessory kit that allows you to quickly convert it to grind your spices with. The stainless steel blades produce seriously good grinds with the aid of the device’s heavy duty motor. 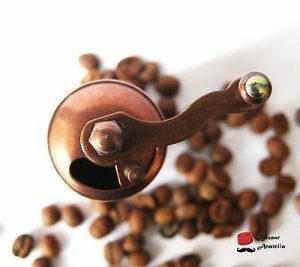 As it has been designed to grind hard coffee beans, you can be sure that no matter what spice you want it to grind, it will do so with ease. It has a sizable 4 Oz stainless steel bowl that is fully dishwasher proof and stain resistant, so it is easy to clean while also being long lasting. 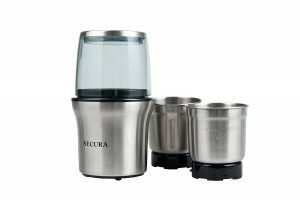 The whole design is nice and easy to use with the separate coffee and spice grinders being easily interchangeable, and in case you are worried about breakdowns, the whole unit comes with a 1-year warranty. This superb design is the top of our hand turn grinders. Its simple 4 piece construction is both effective and easy to use. It comprises a lid, grinder, filter and a bowl, all of which are the essential components of a great grinder. It’s made from a heavy duty zinc alloy, which means that it is durable and won’t corrode or rust. It is an easy screw-together design that not only makes it really easy to use but also very easy to clean. The whole design is only 2 inches by 1.4, so it is nice and compact for storage, though this does mean that it is only able to grind small amounts of spices at a time. This is a really great grinder for all those cooks that only use small amounts of spices at a time and love the feel of grinding by hand. If you are looking for a great low-cost electric grinder, then this is the one you should choose. As far as customer satisfaction goes, there aren’t many models that outperform this one. It comes with 2 removable stainless steel bowls, one of which is for coffee and the other for spices. This means that you can use it to grind coffee, nuts, and even vegetables with no trouble at all. It is really easy to clean which is always a huge plus when it comes to anything to do with the kitchen. Sadly it does lack a little in terms of power which means that under load it doesn’t produce quite as nice a grind as the KitchenAid design. For all of you who want to give your kitchen or dining table a real air of exotic elegance, this beautiful grinder is definitely for you. It is a wonderfully crafted Turkish style grinder that uses the old fashioned top screw design in order to operate. It is available in a range of different finishes that include the sophisticated silver, the stately antique gold, copper, and several others. The mechanism itself is excellent, and thanks to its high-quality blades, it produces a really consistent and fine grind. What’s more, you can also adjust the grind size to suit your needs which is a feature that most other hand operated designs don’t offer. If you have the money to spare and want to invest in a really good high-quality blender then this is a great option. You will need to buy the blender base in addition to this grinder piece in order to use this but after you do you can expect nothing but the best grinds. 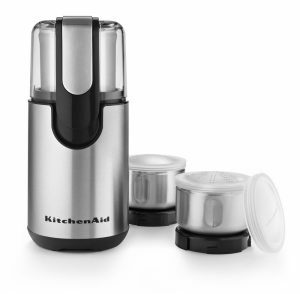 As an added bonus, there is a huge range of other top pieces available, which means that you can use your blender for smoothies as well as all the other things you can use a normal blender for. 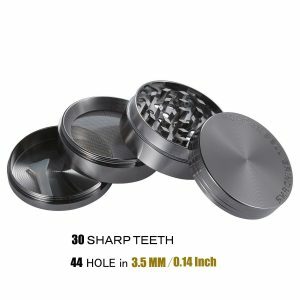 This grinder kit features a large capacity bowl that you can really do some serious grinding with. It features some handy measurement marking for all of you who want to be exact about how much coffee you want to make in one go. The separate motor unit comes with variable RPM speeds so you have plenty of control over your grind speed, which really can make a big difference, especially with coffee. Overall, this is definitely the best electric grinder on this list, though the fact that it comes with a hefty price tag is no doubt off-putting for many. When it comes to flavor, spices are one of the most important parts of the dish. To make sure that you are getting the best from your spices, you should invest in a really good grinder. As you can see from this list, there is a huge range of choices available, so you should always remember to spend a little extra time to do your research to make sure you are getting the best one for your needs.